This two-piece long ivory white prom dress from the designers at Elizabeth K is a heavenly sight. The sleeveless long white formal dress has a gorgeous crop top that sparkles with swirls of lace bejeweled with sparkling crystals. 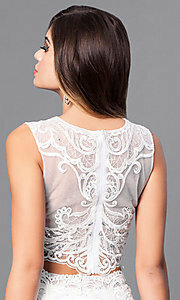 Illusion mesh graces the bodice at the scoop neckline before draping over the shoulders to the sheer back. Matching beaded-illusion lace crowns the natural waistline of the long jersey skirt that fits smoothly over your curves before pooling into a train t the floor. A thigh-high side slit completes the look for prom or formals of this divine two-piece long ivory white prom dress that is fit for an angel. Top 14", Bottom 48", Hollow to Hem 62"